Nota is an a cappella group of six male vocalists hailing from San Juan, Puerto Rico. The group met in 1994 and started singing together occasionally. Nota gained national attention and acclaim when they appeared on and won the first season of the NBC musical competition The Sing-Off in 2009. You can’t rush a good thing, especially when that thing is this good! 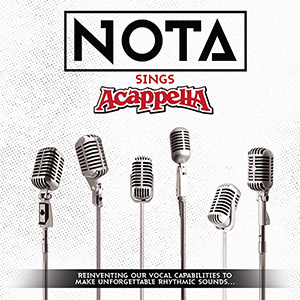 Several months in the making, Nota and The Acappella Company are proud to release the full album “Nota Sings Acappella.” Covering ten Acappella favorites, Nota brings their own unique, high-energy style and sound, weaving a musical tapestry that is simultaneously an homage to the original recordings while modern and fresh in their execution. With featured guests including Keith Lancaster, Rodney Britt, George Pendergrass, Wes McKinzie, Anthony Lancaster, Kevin Schaeffer, Misael Mañon, Test a T and the Nota Kids, this is one you won’t want to miss!